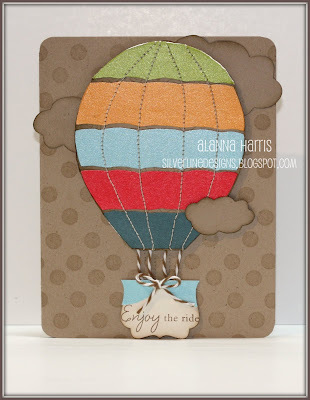 Here is how the card came together...I hand-drew my balloon and cut it out of kraft cardstock. I then cut out the stripes in different colours. Once they were adhered to the balloon base, I stitched the seams for dimension. All of the edges are sponged with distress ink which gives additional dimension. I had to do all of that twice because my sewing machine ate my first balloon and completely wrecked it. ACK!!! The basket is made from half of the decorative label punch topped with a large scalloped border. The sentiment fit perfectly on the basket - YAY! The balloon is accented by kraft clouds and baker's twine ropes. Cute design, Alanna! I love the bright colors against the kraft and the basket is so creative! Cute card, Alanna! I love all of the bright colors!